As the winter months approach, generally the outdoor entertaining areas tend to be used less and less due to the cold weather driving people inside. This advice from experts will show you easy ways that you can create a comfortable and cosy space to help you get the most of your outside room all year round. Always include lots of colour in the design, as colour can add cheer to the dreariest of locations. A carefully positioned pot or bunch of flowers brightens the darkest of corners, or another idea is to use colourful cushions, rugs, tablecloths or serviettes within the space. Make sure that your patio has a covered roof – a pergola is an excellent option for this, as it will provide shelter from bad weather in winter and shade protection from the sun in summer. Block the weather by investing in some good quality outdoor blinds. These are made from heavy duty materials, such as PVC, and are designed to serve as temporary walls which can be rolled up during warmer weather. There is a huge variety of fabrics and styles to choose from, so you’re guaranteed to find the perfect match for your outdoor room – they even come in a motorised version for easy use. By blocking a majority of the nastier weather, people will be more inclined to use the entertaining space. Cover the glass of any windows with clear plastic contact – you will be surprised at how much cold this stops. Don’t forget to cover the patio door while you’re at it. If you have invested in blinds and have adequate overhead space, consider having a ceiling fan installed. Even on the lowest setting, a fan will push the heat down to keep the room warmer, and will also lower overall heating costs as well. Always have some type of heat source during the winter months. An outdoor fireplace is awesome but often impractical for the average entertaining area; alternative heat sources include gas or electric patio heaters, a chiminea, a fire pit or an outdoor oven (such as a pizza oven). 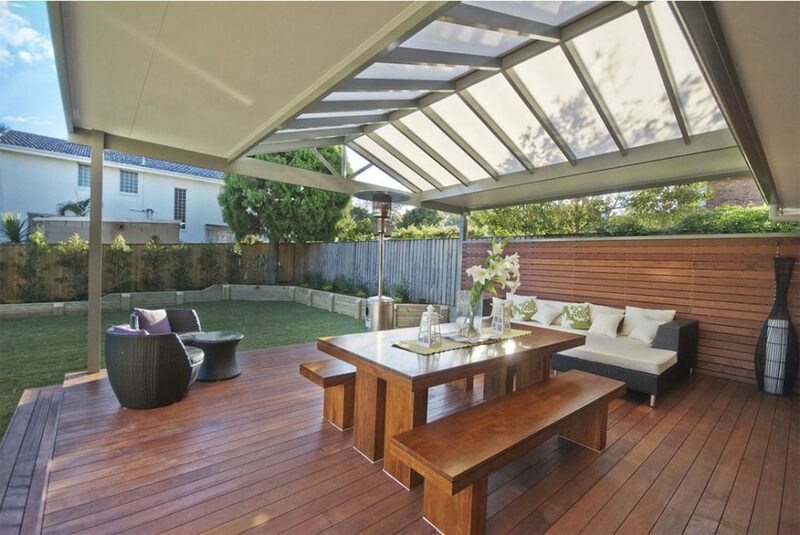 Keeping the outdoor space warm makes the area more inviting and comfortable. Remember to always use a chimney balloon to block cold draughts when the fireplace is not in use. Fill any gaps or holes on fixed structures to reduce draughts and cold spots in the entertaining area. This includes gaps around electrical sockets, plumbing, windows, doors and any other draughty fixtures. Keep a supply of weather-stripping, window caulking and sealant to get those gaps sorted. No matter what type of outdoor entertaining space you have, by making a few minor adjustments you can have use of your area all year round.